Global demand for gold topped over 3700 tonnes or metric "tons" in 2013 and according to the World Gold Council that is worth around 170 Billion dollars. But where does it all go? Who is saving or hoarding, if you will, all this gold? Well, as you might expect, countries and banks are the biggest collectors of gold bullion. From the smallest to the largest, here is a list of the ten countries that store the most gold. The Netherlands has 613.5 tonnes of gold. This is over half of its reserves at around 52.6 percent. Japan is next with 765.2 tonnes of gold stashed away. But this represents only 2.4 percent of its reserves. Russia is next with 1040.1 tonnes at the last count but is adding gold as fast as it possibly can. In 2013 it added 77 tonnes of gold to its reserves which now stand at around 8.3 percent indicating a new policy on gold. Switzerland still holds slightly more gold than Russia at 1040.1 tonnes, however. But this represents only 7.8 percent of their reserves. In 2013 the Swizz People's Party citizens held a referendum to prevent the central bank from selling 'their' gold and to hold at least 20 percent of their assets in gold. China is perhaps the biggest buyer of gold in the world right now. Due to the closed mouth policy it is difficult to get an accurate figure on China's gold. The 'official' figure is around 1,054.1 tonnes but it is considered to be higher, especially when, as in 2013, China bought 1,065 tonnes. Estimates by gold analysts have put Chinas gold reserves at around 3000 or 4000 tonnes and, with the Chinese policy on buying up not only gold but also gold mines around the world, this is not difficult to believe. France has a declared 2,435.4 tonnes of gold and this represents a massive 64.3 percent of their reserves. Where they keep it all is anyone's guess but an indication might be drawn from the attempt to steal gold bullion worth around 1.6 million from a plane at Charles De Gaulle airport bound for Switzerland. Italy dug its heels in and resisted selling any of its gold during the Eurozone crisis and still holds around 2.518 tonnes which represent around 65.9 percent of their reserves. Germany did the same, holding out its gold reserves, a massive 3,387 tonnes, representing almost 68 percent of its total reserves. However it is though that most of this is in the USA and the Bundesbank is currently in a struggle to repatriate this gold from the USA. It has around 30 percent stored in the German Central bank only but wants much more with only a smaller portion stored in New York and London. In a recent press release, the central bank explained said, "With this new storage plan, the Bundesbank is focusing on the two primary functions of the gold reserves: to build trust and confidence domestically, and the ability to exchange gold for foreign currencies at gold trading centres abroad within a short space of time." "... Accordingly, I have directed the Secretary of the Treasury to take the action necessary to defend the dollar against the speculators. I have directed Secretary Connally to suspend temporarily the convertibility of the American dollar except in amounts and conditions determined to be in the interest of monetary stability and in the best interests of the United States." Since then the printing of paper money has gone like a forest fire in the wind and reduced the value of the reserves as a result. The US now has a never ending 'Quantative Easing' or money printing to pay (and add to) all debt and the value of the reserves as against the dollar are decreasing as a result. Coupled with the refusal to allow anyone to actually see the gold reserves and the reluctance to hand over Germany's Gold as requested, has given rise to much speculation of the continued existence of their gold reserves and, indeed, any gold reserves they hold for other countries, i.e. Germany. 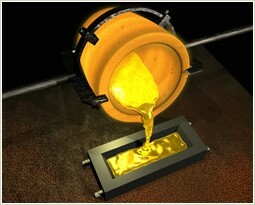 The rest of the world holds the balance of gold but for how long is anyone's guess. China is currently buying up gold faster than it is being dug out of the ground. This plus other major and smaller countries, busy buying gold means that the quantity of gold available will become less and less. Eventually the crunch will come and the so called 'futures' price of gold will rise to match the true value of gold as placed upon it by the nations busy collecting and hoarding as much as they can.